Update Monday October 22 at 2:23 p.m.: In an NPA release, Sim conceded the election to Kennedy Stewart and congratulated him on his victory. Update Sunday October 21 at 1:30 a.m: Sim refused to concede, but unofficial results posted by the city have declared Kennedy the winner. The results will be finalized on October 24. At the end of Election Day, Vancouverites have elected Kennedy Stewart as the new mayor and brought a wave of Green candidates to city governance. Stewart’s victory makes him the first mayor in decades to be unaffiliated with a political party. The last was Mike Harcourt in 1986. But he is far from being a newcomer to politics. Prior to this mayoral election, he served as an NDP MP for Burnaby-Douglas and Burnaby South ridings between 2011 and 2018. As results rolled in from 133 voting locations, Stewart and Ken Sim of the more conservative Non-Partisan Association (NPA) were neck-to-neck — but Stewart managed to hold the lead for most of the night. In the end, he received 28.72 per cent of the votes in comparison to Sim’s 28.15 per cent. Independent candidate Shauna Sylvester was in third place with 20.49 per cent of the votes. 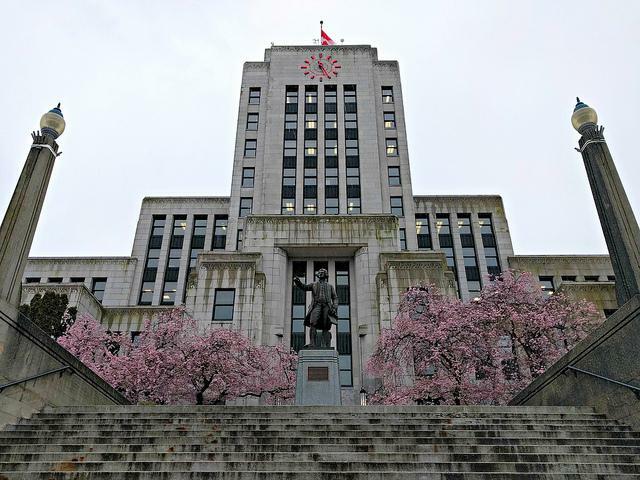 Coalition Vancouver’s Wai Young and Yes Vancouver’s Hector Bremner trailed far behind in fourth and fifth place, with 6.85 per cent and 5.73 per cent respectively. But the big winners tonight are the Greens. They dominated the Park Board race, with incumbent Chair Stuart Mackinnon as well as newcomers Camil Dumont and Dave Demers leading the pack in terms of votes. Two NPA candidates, John Coupar and Tricia Barker, as well as John Irwin and Gwen Giesbrecht from the Coalition of Progressive Electors (COPE) took the remaining four commissioner seats. For City Council, NPA’s five elected candidates — Melissa De Genova, Colleen Hardwick, Lisa Dominato, Rebecca Bligh and Sarah Kirby-Yung — edged out three Greens, who are Adriane Carr, Pete Fry and Michael Wiebe. Longtime homelessness activist Jean Swanson of COPE and One City’s Christine Boyle also got a seat each. The Greens and NPA then tied with three elected candidates each for School Board trustees, an election that was also open to residents living west of Blanca. They include Janet Fraser, Estrellita Gonzalez and Lois Chan-Pedley from the Green Party, and Oliver Hansen, Fraser Ballantyne and Carmen Cho from NPA. One City’s Jennifer Reddy, COPE’s Barb Parrott and Vision Vancouver’s Allan Wong shared the remaining three seats. Notably, Wong’s election saved the incumbent party from a complete wipe out. Stewart’s election marks the end of a tense election cycle, centred largely on the housing crisis. While his housing policies largely mirror incumbent Gregor Robertson’s 10-year housing plan, Stewart also plans to add 13,000 more units. It also raises important questions about the future of the Broadway subway extension to UBC in question. Stewart told The Ubyssey last month that he supported extending the subway — but he was not necessarily in favour of starting right away, and had additional reservations about making the project happen. While a majority of Vancouverites support the extension of the subway to UBC, funding has yet to secured to expand the line beyond Arbutus Street. “No SkyTrain or transit line would ever get built without provincial or federal support,” he said. The new mayor-elect and councillors will take office in November. This article has been updated to clarify the results of the Park Board race.